Hi my name is Caryn. I have coached the giirls Varsity Basketball team at Rockville High School as well as current cocach of the JV Volleyball team. Current JV basketball coach at East Catholic High School. I am also a Physical Education/Health teacher at the high school. I graduated from Wethersfield High in 2000 where I continued my education at Roger Williams University. I led the Lady Hawks in rebounding and points per game. I broke the school record in points in a season. I was named Female Rookie of the Year in 2001. I transferred to Eastern CT State University and went to the Women’s Division III Final Four in 2003 and our team placed second in the nation. I graduated in 2004. I have coached camps with the AAU Northstars as well as the CT Bandits. I look forward to working camps with my cousin Bret! YGB is proud to have Matt on board. Matt is a loyal and honorable young coach who is well liked by campers. It is not uncommon for campers to chant his name during drills. He always strives to do his best in the classroom and on the court. Matt graduated from Newtown High School and took Advanced Placement courses. He made high honors every marking period while in high school. He has been accepted into the Honors program at UCONN. He truly impressed the coaching staff with his instant encouragement of campers and energy that he brought to the YGB camp experience. He loves basketball and helping others to gain the valuable experience he has. Has accomplished all that she possibly could through YGB Camp. Has given even more now as coach. A great personality, works well with children, loves the game of basketball and is a great talent out of Shelton. On the high honor roll academically. Has a 3.7 overall GPA. On the Varsity Basketball team. More importantly to her she serves her time on the Appalachia Club and volunteers her time to rebuild homes for the less fortunate. Also member of the soccer team anddances. Lauren is a new addition to our staff. She has had a stellar career as a camper and now gives back. She plays competively for the high school soccer, hockey and lacrosse teams and is captain for all of these teams at Notre Dame. Lauren is an incredible athlete and has played basketball her entire life. Lauren is vice president of her class. She has a great passion for the game and comes from a hardworking family. She instills these values in our campers. Chris values his participation in community service projects. He loves to play basketball and ski. Was a member of Newtown High School’s football team and is applying to Quinnipiac University. Matt is a student at Castleton College. As a first time coach he brought a lot of enthusiasm to the camp environment with his thunderous dunking ability. As a high school standout he was a member of the wrestling team. Andrew was a member of both the soccer and basketball teams in high school. Andrew has also been a camper at YGB in his younger years and enjoys the camp environment. Kelly brightens the day of campers with her spirit and YGB camp experience. She played on the Stafford High girls basketball team as well as cheerleading team. 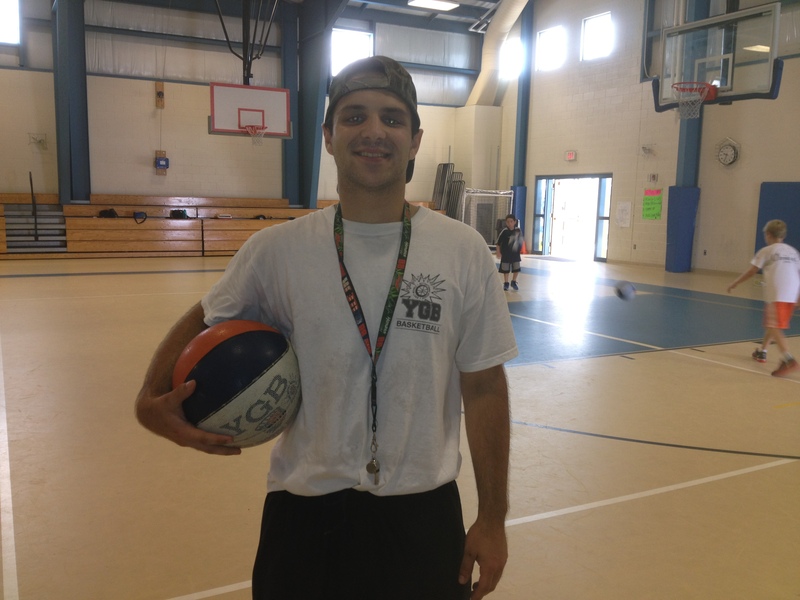 John attends Rhode Island College and has been dedicated to give campers a great basketball experience. John has the ability to put a smile on the campers faces and enjoys the game tremendously. John not only loves basketball but is also an avid fisherman. Steve is the freshmen basketball head coach at Wolcott High School. He led his team to an amazing 17-1 record. Steve also played in high school as well as being a member of the cross country and track teams. He was a 4 time All-State and Class MM State cross country champion. Steve went on to Bryant University where he ran cross courntry and track at the college level. He loves to travel and has lived in London for a period of time. Campers have enjoyed Steve’s experience and basketball devotion. PJ was a member of the 2011 UCONN men’s NCAA Championship team. He was a two time member of the All-Academic Big East Team. 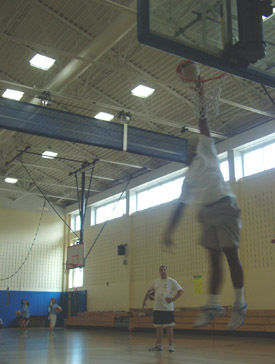 PJ was captain of the Newtown High School boy’s basketball team as a three year varsity player. He made the All-SWC honorable mention team, All-SWC first team, Danbury News Times All-Area team as well as the All-State Academic team. PJ brings a lot of energy and wisdom to the camp. PJ brings a lot of energy and wisdom to the camp. His positive attitude and mature approach really stands as a model for campers of all ages. His positive attitude and mature approach really stands as a model for campers of all ages. PJ is also an Honors student. PJ attend UCONN and hopes to walk on to the team. 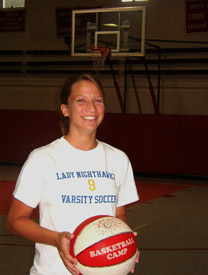 Was a Newtown High School standout athlete for girl’s varsity basketball team. Member of the varsity team since her sophomore year and became captain of the team as a junior and again as a senior. Her hard work earned her All-Conference in her senior year. She also ran on the cross country teams and was captain of that sport as well. Senior Editor in Chief of the Yearbook! Katie was also a dominant force of Elms College basketball team. As captain of the team in her second year Katie helped her team win the NECC Championship. Katie was the third leading scorer on the team as well as third in conference. She’s helped lead her team to their best record in 10 years – ranked 2nd in conference. She was selected to be second team All-Conference. She also helped the team go all the way to the conference finals – first time in the history of program. She made Dean’s List every semester of college. Katie has now earned a full ride to University of Houston to continue her education. Campers enjoy her enthusiasm and spirit for the game of basketball and life! Meghan brings a great deal of energy, enthusiasm and knowledge of the game. Not to mention a great jump shot! She is involved with the cross country, basketball and track teams. She is also an honor roll student. Hi, I’m Raquel and I’m a student at Bryant University majoring in Marketing with a Communications Minor. I am the women’s Division I team manager for the basketball team. I made Dean’s list and am an Bryant Ambassador. I graduated from Danbury High School. I played on the soccer , basketball , track & field teams at Danbury High. Captain of the basketball team. Won the Sportsmanship Award for both basketball and Track teams. Track team won the FCIAC Championships while Raquel placed 11th in javelin. She is a peer leader in high school. Member of National Honor Society. School store manager and DECA 2nd place International Award. I enjoy most sports, but my favorite is basketball. I’ve played since 4th grade and continue to get better. I have won numerous awards playing basketball including a varsity basketball scholar athlete. . In academics, I am ranked overall 13 out of 880 students and is a member of the National Honor Society. In the future, I plan to go to college and hopefully continue playing basketball or become a coach. Sean is a former camper and YGB recipient. As the oldest sibling he knows how to interact with the younger campers. Our young campers look up to him and he enjoys being able to make a difference. Andrew played for a dominant Fairfield Prep basketball program. He received the Coaches Award. He played on the varsity team all four years. His team recently finished 17-3. Former You Gotta Believe award winner. High School basketball player and track member. Brendan is off to a great start in his athletic and academic journey. He has a special ability to work with young people and has a caring heart. It is nice to see a stellar high school athlete work with such compassion with campers. Brendan is a member of Newtown High School’s basketball team. Campers love Bryce! He is a Newtown High School student. He loves playing basketball and football too. He has his eyes set on being an engineer. Bryce has a blast working with the younger kids and teaching them the game of basketball. His positive, upbeat approach makes a difference for each child to learn, grow an d become an even better person. Talyor is a student at the Sacred Heart Academy. Taylor has been to Europe as a student ambassador and plays on the lacrosse team. She also has achieved high honors while being a member of the Drama Club. Member of basketball and baseball varsity teams at Newtown High School since freshmen year. Member of football team since sophomore year. Basketball and football team captain. MVP on football team. South-West Conference All-Division for basketball, Honorable Mention for baseball and All-League football. Member of the Student Handbook Committee, Tour Guide for Freshmen Orientation and volunteer for various youth organizations. Takes pride in being a role model for three younger brothers. Ellen if finishing her stellar career as a student athlete at Elms College. Her focus of study is nursing and has over a 3.85 GPA. On the basketball court she has been the starting point guard for the Elms College basketball team her entire career. She led her team in the 2011-2012 season to win the NECC championship and lost a heartbreak in the 2012-2013 championship. Ellen is the second All Time leader in assists per game and fourth in 3 pointers made in college history. Her most recent two seasons she has gone on to become a member of the NECC All Academic Team. Ellen has brought all of her experience to the field of coaching as she has been a top Assistant Coach for the Connecticut Starters AAU Club. We are very grateful for her leadership at YGB! John was a college athlete. He was a member of a strong Albertus Magnus College basketball team. As point guard, he led the team and conference in total assists per game as well as assist to turnover ratio for the last two years. John made Dean’s list with an overall GPA of 3.9. John is now a high school math teacher and freshmen basketball coach. John is proud to mention that he is now also recently engaged. College: Keene State College – Played forward and was instrumental in bringing his team to the Sweet 16 in the NCAA tournament. Interests: Playing basketball, lifting weights and biking. Kristiana is a former YGB camper and award winner. She is a member of Newtown High School’s soccer and basketball teams and a member of the SWC championship team. She has won the prestigious sportmanship award three times for both soccer as well as basketball. She loves basketball and hopes to bring all she knows to help campers succeed as well! Josh is a respected student-athlete by his peers and faculty at Newtown High School. He is a member of the varsity basketball and soccer teams and is a high honors student. He is active in the school community as a member of many clubs and offers his time and talents to the community especially in his youth group. Lukus, former YGB recipient, stands for everything we try to accomplish. He is a mature, well liked responsible young man who strives to make a difference in the lives of our youth. He was an outstanding camper in his athletic ability and talent. He brings a lot to our program. Lukus is a member of the Chase Collegiate School and plays on both the varsity basketball, crew and golf teams. He is a Founders Scholar, participates in the choir and was elected as class president. His favorite subject is History. Laura bring a lot of excitement to camp with her energy and love to help young people. She has played basketball her whole life and is also a strong student. She has always made the honor roll in the classroom and has been nominated to attend leadership confrerences from a young age including the 2009 inauguration of President Obama. Student at University of Virginia. All-time leading scorer at Newtown High School for Basketball, Two-Time All-State Basketball Player, Wendy’s High School Heismen. Plays for Virginia’s rugby team finished 3rd in the Mid-Atlantic region, highest finish ever.Most of proud of my family and my parents. Have older brother, John, and sister, Tara, and a younger sister, Darcy. Pride myself on hard work and having fun. Darcy is ranked number 4 in her class of 385 students at Newtown High School. She received the prestigious honor of becoming a national merit scholar finalist. She is a member of the varsity soccer (captain), basketball and track teams. She was an integral member of the Class LL State Championship for girls’ soccer in 2004. She was also a member of the SWC Champion girls’track team. She enjoys hiking and snowboarding as well. What makes Darcy special is that with all her accomplishments she is most proud of her efforts toward rebuilding houses for the less fortunate. 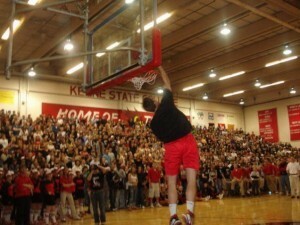 Played on Stafford High School basketball team. Was on varsity team as a freshmen. Loves the game. He also was a member of the football team. In his very first year in track and field he qualified for all-state in the 4×400 relay and all-conference in long and triple jump. He was President of his class and now a student at Central Connecticut State University. Brian is a past camper and is very tall. He is also brilliant. He ranks in the top 5% of his class. He is being strongly recruited to play basketball in college for Ivy, Patriot and NESCAC schools. Former student at East Catholic High School and YGB camper now teacher! Hi, I’m Laura. I’m a counselor at the You Gotta Believe Basketball Camp. I played basketball for five years, up until my sophomore year in high school. I also play on the soccer team and run indoor and outdoor track. I have been an all-state athlete in track for the past two years in indoor and outdoor, and this past winter competed in the New England Championships. Her initial goals were to pursue a career in teaching and playing soccer in college. Played for Newtown High School varsity girls team. Now a member of Keen College womens team. This team finished 2nd in conference who also beat the 4th ranked team in the nation. A member of the All-Academic Team. Campers love to challenge her one on one. Has perfect form! Mark is a middle school Physical Education teacher. He also works as a physical therapist. He is an active member of the community by also being involved with the Park and Recreation Department. He directs the annual Rooster Run 5k and enjoys teaching classes to help students with special needs. Mark lives with his wife and three children. Elliott Gualtiere lives in Shelton, CT with his wife Maura and his two sons, William and Nicholas. He currently serves as the Director of Campus Ministry at Fairfield Prep. Elliott had a an awesome time coaching last summer in the YGB Camps and is looking forward to another fun-filled summer. Elliott began coaching right out of college (he attended Fordham University) working with teenage boys in a PAL (Police Athletic League) in Brooklyn, NY. He also coached a parish youth group team while doing service work at a Catholic parish in Brooklyn, NY. He then coached high school girls from 1999-2005 in the Bronx, NY. During this time he worked in summer camps coaching grammar school kids. Elliott loves the game of basketball and just loves working with young people to improve their game and be excited about life. Erinn has made an immediate impact has a strong coach who values young people and understands our vision of creating great players and people. Having had YGB camp experience herself, she values camp and what we have to offer. Erinn runs on her varsity track & field teams for both the indoor and outdoor seasons. She has qualified for states in sprinting events in all of her seasons. She is also a leader in her school community as member of Key Club, Technology Club and National Spanish Honor Society. She received the Antonine Scholarship for Sacred Heart Academy. Erinn is on the high honor roll and participates in the musicals. She has been a wonderful addition to staff. Meghan is a proud past camper of YGB. She has been playing basketball ever since she was a child. She has maintained her skills on and off the court and in the classroom. She loves photography and was a member of the basketball team in high school. Natalie has been a varsity player for East Greenwich High School for all four years. She works on her game year round. She is a student at University of Rhode Island studying Bio-Pharmacy and planning on entering the pre-medical field. She is also a three year soccer player and coaches camps. She loves to bring energy and excitement to the campers. She is a veteran coach who instantly builds rapport with the campers. She has a lot of energy and enjoys giving back to YGB. Erin is a former camper now coach. Campers will try and beat her at foul shooting but it will be difficult as she has won this tournament just about every year she was a camper. Erin attends Sacred Heart Academy where she is treasurer of her class as well as treasurer of the random acts of kindness club. She is secretary of SADD and the Key Club. She is a member of the varsity field hockey team and has maintained a 4.0 grade point average. Erin is also co-captain of the fencing team and plays on the softball team. When she has time she participates with the AU Cougars of Seymour. Jordan made an immediate and effective impact on campers and coaches as a first year coach. She is now a veteran coach and brings spirit and energy and has fit into our program very well. An example of her talent is when she made the varsity basketball team as a freshmen. She was captain of the varsity team for basketball in both her junior and senior years. She was also captain of the soccer team. She is a member of the National Honor Society and treasurer of this organization. In addition, she is her class treasurer and Peer Mentor. She loves to go to leadership seminars and the campers truly benefit from her leadership ability. She is a member of Unified Basketball program. She also plays on the softball and soccer teams. Jordan is an all around athlete with a zest for life. Alex has participated as a YGB camper and has gone off to do great things. He has played on the baseball and basketball teams every year in high school. He has also been on the honor roll every semester. I have firsthand witnessed Alex solve a Rubik’s cube in less than 2 minutes – and I really mixed it up! He is very smart and personable and campers enjoy working with him. His favorite hobby is Frisbee golf. Luke, a former camper, played basketball, soccer and golf for all of his years of high school so far. Jake, former camper, plays basketball, baseball and soccer at Stafford High School. As a first year coach, Lee brings his experience of working as a teacher to caring for our young people. He also helps to create great players with his basketball background as an experienced coach not only in basketball but soccer and track & field as well. Lee is a gifted artist and athlete. He brings an incredible amount of energy and enthusiasm to the camp atmosphere. He has a great sense of humor and wants what is best for each and every camper. We are thankful to have Lee on board who has so much to offer to the YGB experience. Patrick was a former YGB camper and graduated from Xavier High School as valedvictorian of the class. He was New Haven’s Tip-Off Scholar Athlete and chosen to be on the CIAC Academic All-State Team. Pat has applied to our nation’s top colleges and has chosen to attend UCONN as a member of the combined program in medicine. He was captain of both the baseball and basketball teams. He also played football. He has achieved great things. He now is giving back as coach and is fitting in very nicely. The campers really enjoy having Pat at camp . He immediately brought to camp leadership, experience and enthusiasm. We are happy to have Andy be part of YGB. He brings experience and great leadership to the campers. Campers are very drawn to Andy’s enthusiasm and ability to relate to every camper. He is married and is an elementary teacher. He values education and continues to enroll in courses in graduate school. Student at University of Connecticut and Manager of the Men’s Basketball team. 2003 Newtown Bee Sportsman of the Year Award. 2004 Recipient for the Trull Award- A community leadership and academic award . President of Freshman, Sophomore, Junior and Senior Classes in High School. Creator of a web site dedicated to Newtown HS sports from 2003-2005. Heather is a Biomedical Science major at Marist college. She is not only very smart but relates well to the campers. Her funny personality and knowledge of the game helps YGB’s success. She has made the Dean’s list and is also on the fencing team as well as a member of the American Chemical Society. It has been a pleasure working with Maggie in her first year as a YGB coach. She has an incredible speaking ability and presents well to young campers. She has a history of great basketball ability and coaching. Maggie plans on studying civil engineering. Russ played for Manchester High School then as a college basketball player at the Division II University of New Haven. He was a four time Deans List member. Russ became a Peer Mentor at Central Connecticut as well as manager of CCSU’s NCAA Tourney Team. He has coached at many levels including Travel, High School, and AAU teams. Is now an assistant coach at Central Connecticut State University and finishing up his degree. Loves to read. Has tons of camp experience and loves to enrich the lives of the youth. We are pleased to have Doug working his first year with YGB. He brings an immediate professional presence to camp. As a physical education teacher in the Newtown district, he brings passion for learning. Doug is easy going and fun to be around. Doug is also a father and husband who values family and making a difference. Doug has been teaching for 18 years. Michael Mitchell was a member of the Varsity basketball team and Track team in which he lettered in both. In track Michael received an honorable mention for the all SWC Track team. He also went to states for the High Jump. Was 1/4 of an inch away from national recognition on the high jump. Michael is a strong student as well as he graduated in the top five percent of his high school class, was a member of the National Honors Society and is currently a student at the University of Connecticut where he is a member of the Honors Program, he is double-majoring in Political Science and Economics. Michael loves working with kids very much and has been coaching at basketball camps for more than four years. Has incredible energy and a wonderful way of working with kids of all ages. Kelly was an outstanding YGB camper and loves to give back to camp. Her positive spirit is an asset to camp’s success. Student at Danbury High School; Assistant coach of Junior Varsity Girls Sacred Heart basketball team. Ranked 14 of 750 in sophomore class. I have been playing basketball for about 7 years, I was also a cheerleader for 4 years, and I have been playing soccer for about 2 years now. I plan on also doing track next year for Danbury High. Member of Key Club doing community service. I look forward to furthering my coaching career. I would like to go to UConn to major in education and would like to manage the Women’s Basketball team there. Professionally, I plan on becoming an English/Literature teacher for high-schoolers. My motto is to always have faith in your dreams and to accept and conquer the challenges life throws at you! Founder of You Gotta Believe basketball camps. Bret played at South Catholic High School in Hartford winning state championship in junior year under legendary coach Joe Reilly. Played senior year at Wethersfield High School as second team All State and led conference in scoring. Played four years at WCSU scoring over 1,000 points. Played professionally in Ireland, England and on New York Nationals who played against the World Famous Harlem Globetrotters. Motivational speaker, author, high school counselor, husband and father. Andre is a former camper and super athlete. Andre was one of the few to make the Danbury High School basketball team. He is a solid student in the classroom and a humble star! Renzo is a student at Southern Connecticut State University and is majoring in elementary education and psychology with a minor in religious studies. He is a member of the Dean’s list. This is a perfect job for him as he loves to give back to kids. A great role model for campers and full of excellent basketball knowledge. He is striving to play basketball for college and possibly professionally. At Danbury High School; Top 50 in junior class of about 650 students. Black Belt in Tae Kwon Do and Green Belt in Karate (two belts away from black) Very involved in St. Joseph’s Danbury Church/School Events, and dedicated countless hours of Community Service to St. Joseph; Core Member of St. Joseph Youth. Played 4 years of basketball at St. Joseph’s School. Teacher/Lifeguard at Danbury YMCA. Tony graduated from Springfield College. He majored in Physical Education and made the Dean’s List as a student there. He and was a member of the baseball team. He was also an Intramural basketball champion at his school. Tony is a graduate from Stafford High School He was a varsity player for all four years at Stafford High in soccer, basketball, and baseball. He has been named captain for all three of those sports as well. Tony is currently employed as a PE teacher at Birchland Park Middle School. Tony has coached high school baseball and is the JV basketball coach. He also worked as a carpenter for three years and bowled a perfect 300…on the Wii !! From a young age, we knew Maria would make a great YGB coach. She possesses the qualities of a true leader who has compassion for each and every camper. Her YGB camper experience has equipped her to ignite the passion for the game in our campers and help them to become the best they can be. Maria played on the freshmen and JV basketball teams as a freshmen at Sacred Heart Academy. She endured two concussions in this season and has not let them prevent her from being a competitor on the court. She also played JV and Varsity soccer as well as track. Maria is a great athlete and brings smiles to the faces of the campers. Andrew is a former camper who has become an excellent coach. He has a great ability to get to the camper’s level to make learning fun and exciting! Andrew is a former leading scorer in school on the basketball team. As captain of the team, Andrew plays on the basketball, baseball, Indoor track teams and runs cross country for school. He won the 600 meter race this past season. He is also a member of the golf team. Andrew became scholar athlete for cross country, track as well as golf teams and has been an honor roll student. Andrew is a great contributor to camp! Andrew actively gives of himself every day at camp. He has a tremendous amount of experience and offers his expertise to bring out the best in all campers. We are truly grateful for his leadership to help very camper have a successful and memorable camp experience. Mario has become an exceptional coach for YGB. Campers instantly love him and he brings a lot of knowledge to the court. He was a starter on his national bid AAU basketball team and has also been unstoppable playing against the staff at his school. Mario aspires to play basketball in college and attends Central Connecticut State University with a concentration on engineering. James was an outstanding YGB camper. He now chooses to give back and pass forward all that he has learned. As a member of Cheshire High School teams, he has been successful on the cross country team and ran hurdles for the track team as well as the local basketball team. James has a heart of gold and campers enjoy his concern for others and how he just jumps right in to the camp experience by interacting with others. Dan has many talents. He is an honors student in school. Dan is an active volunteer. He is a varsity baseball player. He also plays on the basketball team. Dan is a former camper who won many awards for his character and ability over the years and enjoys giving back to younger campers. George was the one recipient out of 1700 students to receive the President’s Award as well as the Superintendent’s Award, which recognizes students who have overcome great things to be the successful person they are today. George loves the game of basketball and campers respond very well to his enthusiasm. He is manager of the Roger Williams basketball team who helped lead team to conference championship. George made Dean’s list in every semester in his Engineering program. Former camper turned coach. He is mature beyond his years. Was a Xavier student-athlete. Is very strong academically as honors student and brings his expertise to camp. Great leader and example to our young campers. An honors student in the classroom and four year member of the Track Team while elected captain in his senior year. Went to the Nationals for both indoor and outdoor track and came in 13th in the Nation. Also #1 drummer for Jazz Band and #1 percussionist for two years. Now enrolled at Marist College majoring in Biology. Has made Dean’s list and a member of the Chemical Society. Wants to attend physical therapy school. Davis excelled as a camper. He now gives back with enthusiasm and pride. Davis is currently in an excellent college prep program. His wit, charm and basketball knowledge are a hit with the campers. Leah was a former YGB camper who has excelled on and off the court. Leah has great versatility and is very athletic. She was a member of the East Greenwich High School basketball team as well as field hockey. In her very first year as a field hockey player she led her team to an undefeated season as goalie without letting one single goal scored. Leah led her team to the state finals and as a varsity basketball player to the quarter finals. Leah has pleyed 3 years vasity basketball. Leah was a member of the Division I field hockey state champion team as well as Division II state champion softball team. She also went to the junior nationals in DC to compete. Her most difficult decision: which sport to play in college?? as she is currently being recruited for both sports. It is rare to find someone who is multi-talented like Dan. Not only does he excel with basketball but is quite a musician. He studies music at the University of Rhode Island and loves the game of basketball. He offers YGB great diversity with his interests and passion for the game. We are very excited to have Shawn join the YGB team. Shawn has a dynamic personality and knows how to inspire young people to action. Shawn was a guidance counselor at the middle school level and was head coach of the girls basketball team who went on to an undefeated season. He is now Assistant Principal in Wolcott. He has coached track and field at the high school level for 7 years. A graduate from Assumption College he was captain of the track and field team and played basketball at Sheehan High School. Shawn is married and has a dog named Nala. Jeremy is a student athlete at Springfield College. He is studying Physical Education to become a teacher. He played basketball for Rockville High School as well as baseball. He made honor roll every quarter and lettered for cross-country and is captain of the team. A wonderful addition to YGB. Mike has been a wonderful addition to the YGB staff. He is kind, great with kids and an experienced coach. Mike has been a middle school teacher for 11 years. He has been a middle school head coach for over 8 years and this past season coached his team to an undefeated season winning the championship. They are currently now the Junior NVL Champions. Ryan is former camper and all around great young man with a passion for basketball. He has been a YGB camper since entering the third grade. Graduate of Notre Dame High School, Ryan played on the lacrosse team and is on the high honor roll. Ryan ran cross country and is an involved member of his high school community. He also volunteered his time at a local hospital. Ryan now attends school to become a personal fitness trainer. His value for strength, fitness and a healthy lifestyle is a strong asset to our camp. About Tracy… (Forward)Attacking player with unbelievable potential… imposing physical presence with both skill and speed. Background… Named a NSCAA/adidas soccer All-American in 2004 and named a first team All-American by StudentSportsSoccer.com… earned four letters at Newtown HS for head coach Brian Neumeyer… named the 2004 Connecticut Player of the Year… served as team captain in 2003 and 2004… finished as the school’s all-time leading goal scorer with 100 career tallies… helped Newtown HS to the Connecticut High School State Championship… ranked as high as 12th nationally by the NSCAA… led all of Connecticut in goals in 2003 and 2004… member of the National Honor Society… Graduated 24th in class of 316 with a GPA over 90…Amazing player for NHS varsity basketball team…played club soccer for Beachside of Connecticut… captured the 2003, 2004 and 2005 Open Cup State Championship… brother, Ryan plays soccer at Pennsylvania. Personal… Major is undecided… the son of Donald & Marguerite Tracy… chose Wake Forest over Duke, Maryland, UConn and Notre Dame… born Oct. 2, 1986 in Chestnut Hill, Pa.
Jenny is now a student at St. Joseph College studying Business Management carrying a 3.14 Jenny’s passion for basketball is evident in her role as manager of the girl’s basketball team for both JV and Varsity teams at East Catholic High School. She is also an involved member of her school community as a member of the sophomore board as well as participating in the Ambassador’s program. Jenny is now a student at the University of St. Joseph studying Business Management with a minor in Child Study while carrying a 3.14 GPA. In the meantime she also works 3 part time jobs! Donovan, a former standout camper, attends Woodland Regiional High School as an all honors student. He has received the highest GPA’s in Biology and Geometry in his school. He participates in cross country, swimming, fencing and of course basketball! He is a member of Student Council and the Jazz Band as well as being a certified life guard. Donovan’s love of the game and passion to make a difference for our young people makes him a great coach and one who the campers connect to. Nate is a Nonnewaug and Western Connecticut graduate. He was a member of the NBCAA National Team for basketball in Oklahoma. He was also elected as an Academic All-American for basketball. 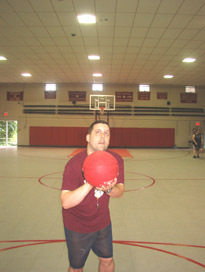 He was the assistant basketball coach at Vassar leading the team to a 19-7 record qualifying for the ECAC tournament. He was also the women’s assistant basketball coach at WCSU completing a 21-6 record. Campers love Nate’s basketball experience and strong sense of values. We are happy to be having Dexton as a coach this summer. He and his teammates offered a free game to a sold out crowd in Newtown following 12/14 to contribute to our community. Ever since he entered YGB as a third grader, we knew Josh would grow up to become a special athlete. As he progressed over the years in YGB, we were fortunate to see him blossom, grow and mature into the young man he is today. He is the starting catcher for East Catholic High School as a sophomore. He made honor roll every quarter of high school. He has made the varsity teams for both baseball and basketball teams since freshmen year. He can solve the Rubik’s cube in about 2 minutes! We are fortunate to have his leadership at camp.